Today the Gym, in addition to serving as a museum for the movie “Hoosiers,” hosts high school teams from as far away as New York & Mississippi for games. Nearly every Friday and Saturday from November thru February, the Gym is alive with high school athletes playing a game in this shrine to basketball. 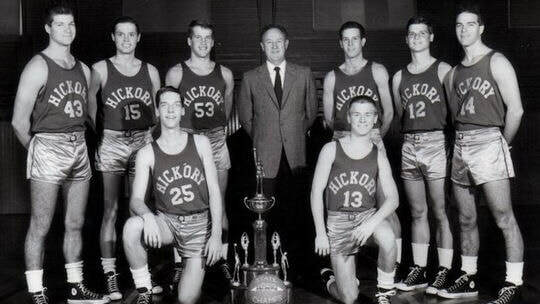 They experience basketball as it was in the era of the Hickory Huskers. When not hosting games the Gym is open for individuals to attempt their best “Jimmy and Ollie” shots. Inspired by the Milan Miracle of 1954, writer Angelo Pizzo wrote the script that became the greatest sports movie of all time. To call it a sports movie is to shortchange the story of small town Indiana and the life lessons that it teaches. Just as the boys of Milan overcame great odds to win the 1954 Indiana State Championship, Pizzo's fictional Huskers did the same to become the movies State Champions of 1952. Today the Hoosier Gym stands as a monument to Pizzo's classic and a reminder that against all odds sometime miracles do happen. "Welcome to Indiana Basketball." "Don't get caught watchin the paint dry."